Mini-Swirlz Peanut Butter is a good cereal, but the flavor is nothing new. In comparison to a more kid-oriented cereal like Peanut Butter Cap'n Crunch, the flavor here is only a smidgen more peanut-butter-authentic. Like Mini-Swirlz Cinnamon Bun, the cereal pieces maintain a respectable crunch even after several minutes of soaking in milk. On the side panel of the box, a pre-teen girl in a striped shirt has a thought bubble jetting out from her head. The question she asks is "Flavor to the 10th power?" Sorry honey. The correct answer is flavor times 1.07 - which isn't too bad. If you're in the mood for a peanut butter flavored cereal, give this one a try. I'm betting that you'll like it. If you're choosing between varieties of Mini-Swirlz cereals, go for Cinnamon Bun. It's way better. A one cup serving of this cereal with fat-free milk has 180 calories, 4 grams of fat (0 trans fat), 1 gram of dietary fiber, 23 grams of carbs and 11 grams of sugar. 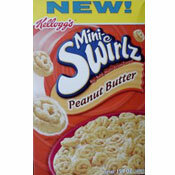 What do you think of Mini-Swirlz Peanut Butter? I can't find it on the shelves to buy!! So it must be excellent. Put more on the shelves... PLEASE!!! This is my all time favorite cereal!!! The only thing is that I can eat about three bowls and still crave more. I disagree it's a smidgen better than peanut butter cap'n crunch. I've always enjoyed that cereal, and I thought the taste of this blew that one out of the water. I tried these and thought they were great.